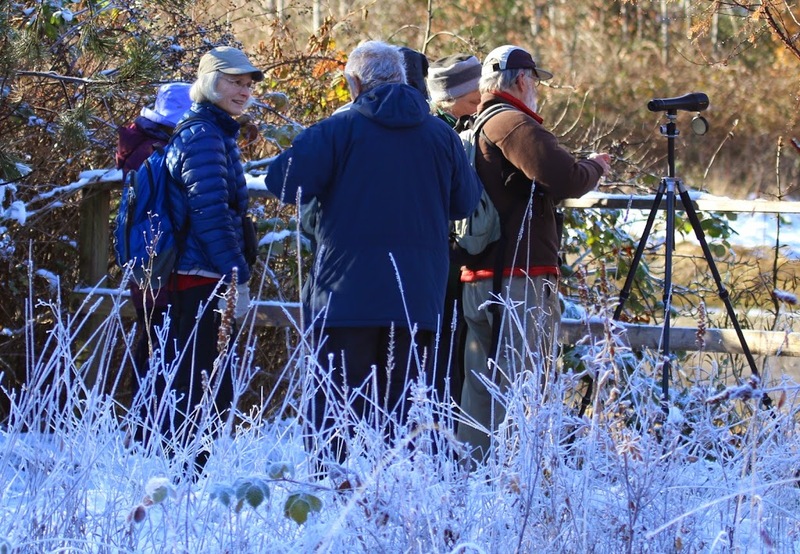 Today, Wednesday December 3, our quaint group of casual birders enjoyed a gorgeous morning of birding, chatting, and walking around the Maplewood Conservation area. We met at the parking lot around 9:15am, and the birds were already gorging themselves at the feeders. First things first, we got re-acquainted with properly ID-ing Song Sparrows (check for the gray eye stripe). Then we observed droves of Spotted Towhees, lots of Black-Capped Chickadees, a Chestnut-Backed Chickadee, a couple of Fox Sparrows, and a few Golden-Crowned Sparrows foraging on the feeders and on the ground below. There were so many Towhees that the birds even managed to keep the squirrels at bay. Flying overhead was a constant stream of Northwestern Crows. Amidst the idle banter, we heard and then located a pair of Downy Woodpeckers. After observing the birds, and frost, and general nice weather, we set off to the shore. The most striking thing about the shore was the low sun blinding us through our bins and scopes as we feebly tried to ID silhouettes. Eventually, we found a smattering of Killdeer trotting about the mud-flats. After that we settled in and found many of the usual suspects including: lots of Gulls, a raft of Mallards, a few Buffleheads, a sprinkling of Common Goldeneyes, a lone Cormorant, and a lone Great-Blue Heron perching on some pilings. The most excitement came when Roger proclaimed to have spotted a Common Teal! Sadly, upon closer examination, it turned out to be an American Wigeon in amongst its peers. Other highlights included Yellowlegs (Greater?) foraging, an actively hunting Belted Kingfisher, an elusive call of a Loon that was heard by all and seen by none, and a trio of Northern Pintails. We moved around the bend and found more of the same, but were also treated to close up-views of a Horned Grebe. The birders who arrived first got to see four large river otters playing and swimming. Wandering through the woods, we admired the ice-covered wetlands. Finally, we did some birding, and were treated to great views of Golden-crowned Kinglets. As we forged ahead, most people saw the elusive Ruby-Crowned Kinglet flutter by and flash his brilliant crest. Again, many towhees and chickadees were seen rummaging through the bushes and shrubs. A Pair of Northern Flickers finally appeared; we heard them calling throughout the park. 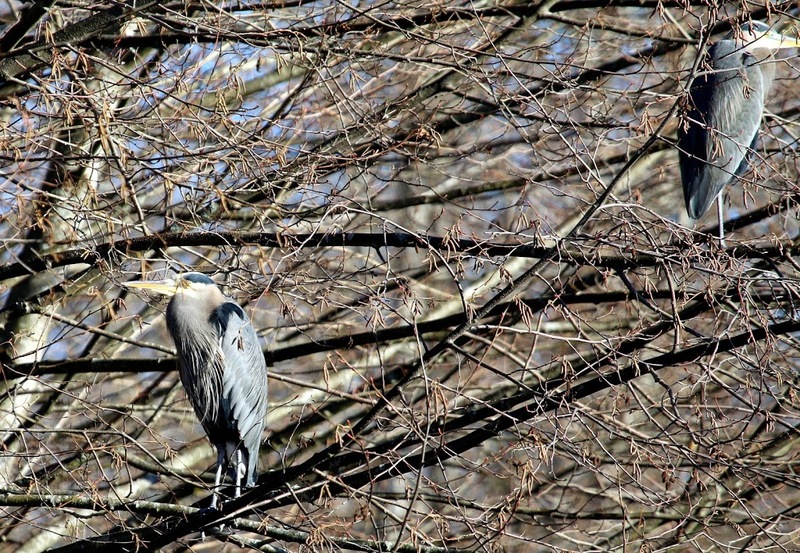 We came upon at least seven Great Blue Herons perched in the woods above a frozen pond. 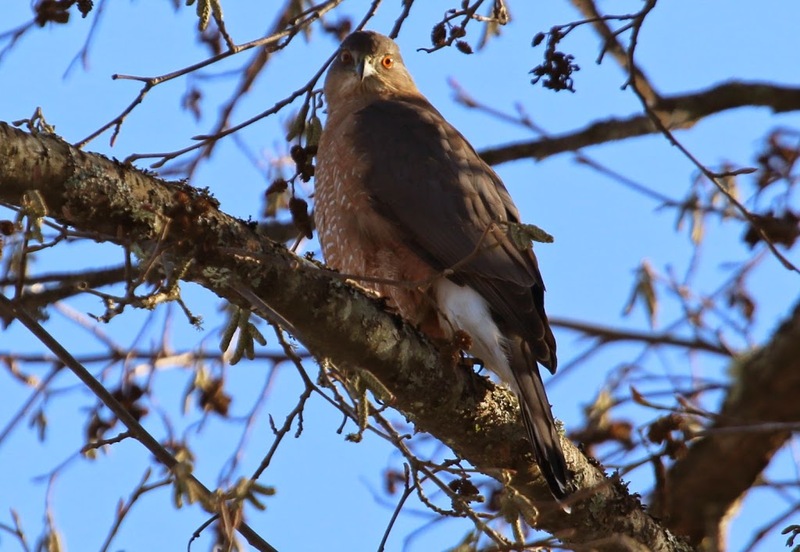 As we admired them, a murder of crows flushed a Cooper’s Hawk and harassed it for a while. We got great views through Brian’s scope and were able to change Greg’s initial call of “Sharpie” to “Cooper’s”. Eventually, we found our way back to the parking lot where we spotted a small flock of American Gold-finches. We blanked on Siskins, Crossbills, and Creepers, but everyone agreed that the weather and company made for a fine morning. As one last hoorah, most of us found our way to New Brighton Park to check out a reported Gyrfalcon. 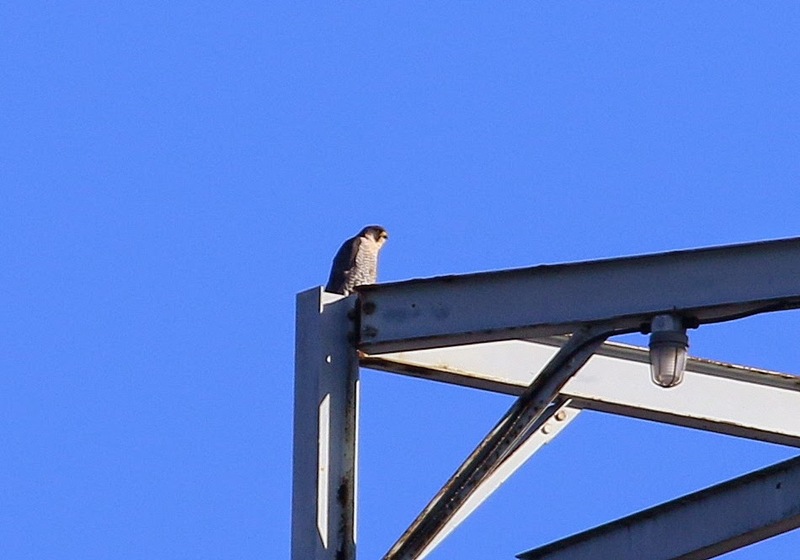 We saw the bird, or should I say, “a” bird… Due to the distance we can’t say with certainty if it was a Peregrine Falcon or a Gyrfalcon. Next week, Wednesday December 10, we will be exploring Burnaby Lake; as usual, leaving Petra’s at 8 am, arriving at Nature House on Piper Avenue around 8:45 am (see map https://goo.gl/maps/D1Cyv). Next DNS monthly meeting is Monday December 8 at Cammidge House, starts 7:30 pm. Guest speaker is photographer, traveler and DNCB member Terry Carr, topic The Quest for Puffins and other Seabirds (more at DNS Meetings page). This entry was posted in *DNCB, Cooper's Hawk, Gyrfalcon, Maplewood Flats, New Brighton Park, Peregrine Falcon, River Otter. Bookmark the permalink.